HSM, the global manufacturer of components and provider of integrated solutions to the transportation, furniture, bedding and a growing number of diversified markets, is proud to announce that Jimmy Bush, senior vice president of corporate development, was presented with the Russell L. Abolt Exceptional Service Award during the 2014 ISPA EXPO. Bush was nominated by his peers for having exemplified the highest level of career devotion to the well-being and betterment of the bedding industry. His involvement includes serving as a past chair of the International Sleep Products Association supplier’s council, a member of the Better Sleep Council, Board of Trustees and Finance Committee, and as past president of American Innerspring Manufacturers as well as other key industry events and programs. The Russell L. Albolt Exceptional Service Award is the highest honor bestowed upon an individual member on behalf of ISPA. "The highlight of EXPO was the gathering of our team to join the industry in honoring Jimmy Bush with the Russell L. Abolt Exceptional Service Award," noted Dave Colburn, HSM president and CEO. "His tireless work in the industry has helped shape our company into the bedding solutions provider we are today. 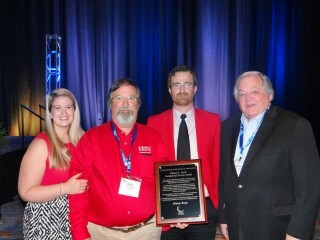 We are so proud of the lasting contributions he has made, not just to the bedding industry, but also to HSM." Bush’s son, an HSM employee, and daughter attended the award presentation, as well as several of Bush’s friends and colleagues. Bush has been with HSM since 1978.